This Smythson Grosvenor Collection Tote Bag is a bag made from grainy calfskin leather and featuring solid brass metal hardware throughout. 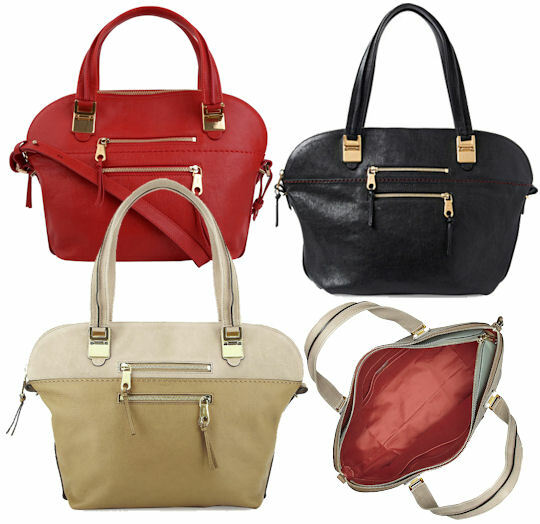 The bag has two structured top handles and also comes with a detachable shoulder / cross body strap. The bag has a flap over pocket on the front with a branded clasp and concealed magnetic fastening and there is a zip fastening pocket on the back with a branded zip pull. Inside, the bag has three compartments, a zipped compartment and a slip pocket. The zip pulls are all branded. The bag is lined in a navy blue Alcantara suede lining. handle drop: 17.5cm/7″; shoulder strap drop: 46.5cm/18.5″ (all measurements are approximate). The ultimate luxurious bag, this East West style tote from the Smythson Grosvenor Collection will add polish to your professional look. It has a chic design, space for a laptop and a spacious central compartment. 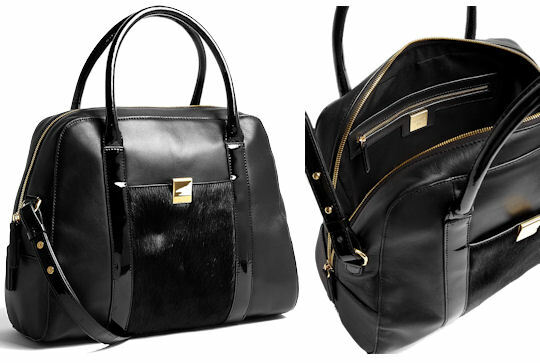 The Raoul Ponyhair Jill Tote Bag is a zip top bag with gold tone hardware throughout. It has two patent leather top handles, a detachable patent leather cross body strap and a front slip pocket that is trimmed with ponyhair, with a gold tone clasp closure. Inside, the bag has two slip pockets and a zip pocket. The bag is fully lined in matching black fabric and there is a gold tone brand plaque inside. This spacious tote bag is a wise purchase for the city girl or fashionista who needs a professional bag that doubles as delicious candy of the arm variety. 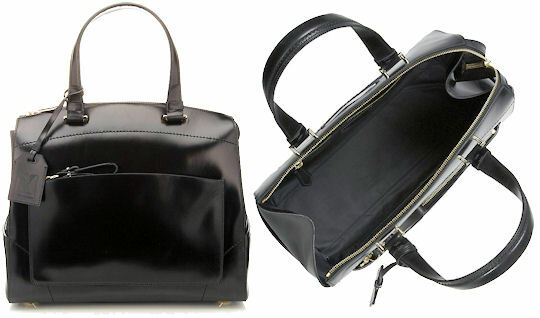 It’s a great bag for completing a smart work ensemble yet is charming enough to be desired at the weekend too. Inside, there is a single main compartment with a zip pocket and two slip pockets. 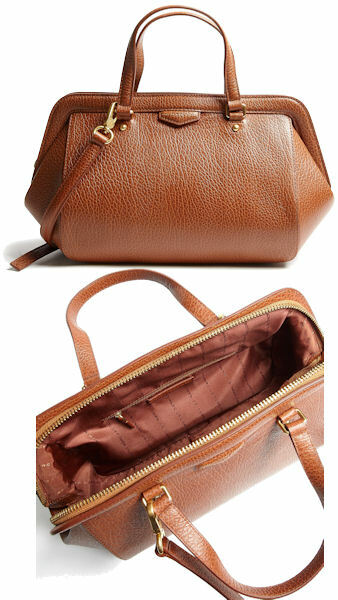 It is fully lined in chestnut Marc by Marc Jacobs logo print fabric. Measurements: 24cm / 9.4″ x 44cm / 17.2″ x 18cm / 7″; strap drop 53cm / 20.9″; all measurements are approximate. This tote is a vintage inspired style so it won’t date and is likely to remain a key piece for years to come. The tan colour will team well with most colours and the structured styles of this bag gives it a ladylike air. It’s perfect for carrying your essentials. 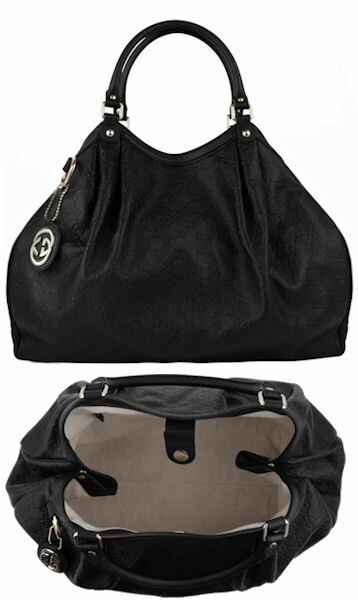 The Gucci Guccissima Sukey Tote is a large black leather bag which has the GG design embossed all over into the leather. It has gold tone metal hardware throughout. It has two top handles and snap closure on a leather tab at the top, with side snap closures too, allowing you to alter the shape of the bag, expanding the size if required. Inside, the bag is fully lined in cotton and there is one zip pocket and two pouch pockets. The bag also has a detachable GG logo key chain. This is another bag from Gucci that looks great worn over your shoulder or on the crook of your elbow. It’s a large bag, but the size isn’t overwhelming whilst still giving you enough room for all your bits and pieces. Made in Italy, it’s a fine example of the craftmanship that goes into the construction of a Gucci designer handbag, and this one is a classic you will enjoy forever. The new Givenchy Nightingale Ball Chain Tote is just in at Selfridges. Stunning in soft smooth leather, this bag is a medium sized Nightingale and has the standard two leather grab handles with logo embossed handle base and the separate, detachable shoulder strap. The bag has gold tone hardware throughout, including the new season addition of golden studded “ball chain” panels which are perfect for this season’s futuristic trend, although this bag is a classic style which will far outlive this season. The bag has a zip top fastening and is fully lined, with two slip pockets and one zip pocket inside. It is delivered with a Givenchy dust bag. Give your elegant lady like look a new season contemporary edge with a classic bag that has new, dramatic detail. The softest leather imaginable and designer credentials make this bag perfect for rock stars and starlets everywhere. The Michael by Michael Kors Chelsea Tote Bag is a shoulder bag made from black or python print leather which has a silver coloured chain trim and a chain and leather handle. The silver coloured metalwork continues throughout the bag, and can also be seenn on the signature circular MK handbag charm which is accompanied by a luxurious tassel key fob. Both can be removed. The chain shoulder straps have a leather inset shoulder rest, and the handles thread through largeeyelets on the front and reverse of the bag. The bag has a zip top fastening and there is an external slip pocket on each end of the bag. Inside, the bag is lined in logo signature fabric and there is a a zip pocket and four slip pockets with a key fob attachment. Style note: The Chelsea is a classic style and perfect for daily use. It’s great for use in the city and certainly packs a punch when you wear it over your shoulder. It’s a spacious style, and I love all the pockets which really helps to keep our bits and pieces well organised. 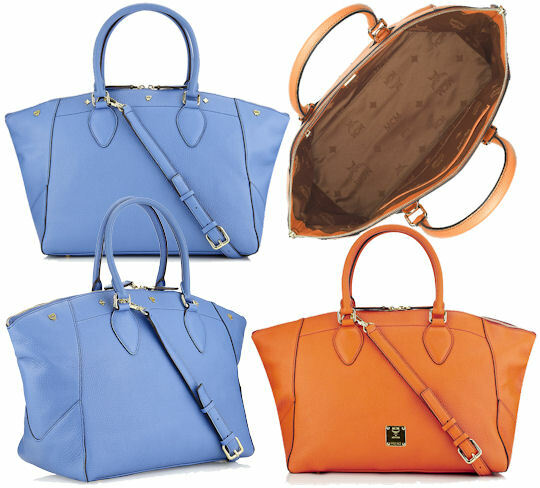 The MCM First Lady Tote bag, available in blue or orange from Harrods, is a pure leather tote bag which has polished gold coloured hardware throughout. The bag has two rolled leather top handles, together with a detachable and buckle adjustable shoulder strap. 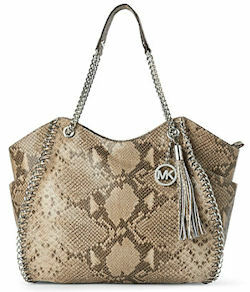 The bag has a two way zip top fastening and there is a gold tone square brand plaque on the front of the bag. Inside, the bag is lined in logo fabric and there is a zip pocket and two slip pockets inside. The First Lady Tote from MCM is something of a show stopper, it has to be said. Made my European Craftsmen, the brand has attracted celebrity fans including Mischa Barton and the brand new MCM boutique has just opened in Harrods. 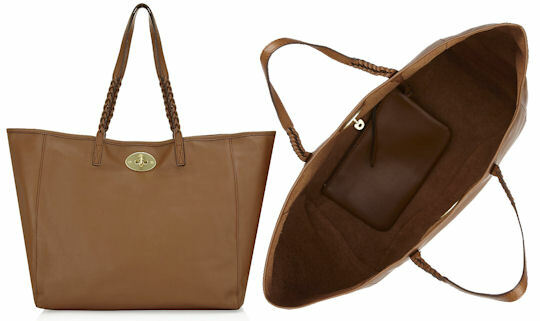 This new bag from Mulberry, the Mulberry Dorset Tote, is an understated yet elegant nappa leather tote bag. It has a minimalist shape with classic elegance, with those intrinsic Mulberry features adding to its charm. 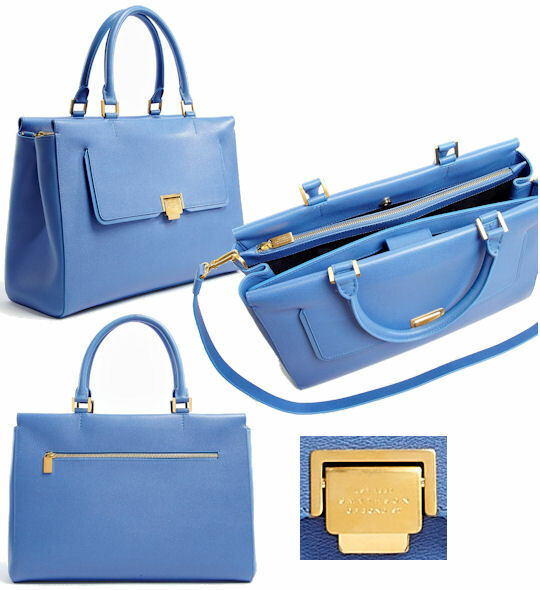 The bag has two partially plaited top handles and fastens with a branded gold tone postman’s lock fastening on the front. Inside, the bag has a single main compartment with a brushed leather interior and comes with an interior detachable zip fastening pouch. The tote is designed to be lightweight yet it can carry up to 7kg, which is the standard weight for hand luggage on many aeroplanes. New, yet instantly recogniseable as part of the Mulberry family, this super slouchy tote will soon become your new best friend (we girls are so fickle!) Choose from four bang on trend colours, I’m particularly attracted to the luscious Forest Fruits . The Reed Krakoff Uniform Bag is a black tote bag which has been hand made from polished calfskin and burnished bridal leather. It’s a structured bag which has two leather top handles. There are external two slip pockets on the front of the bag and a zip fastening pocket on the back. The bag has a zip top fastening and all the metal hardware is gold in colour. It has a detachable black luggage tag. Inside, the bag is fully lined in black material and there is one zip fastening pocket and two pouch pockets. The Uniform Tote Bag from Reed Krakoff is a bag which is both timeless and elegant, taking it’s inspiration from bespoke handmade luggage from years gone by. 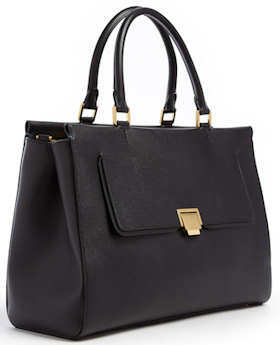 Structured and ladylike, this bag is an investment purchase which would bring pleasure for many years to come. 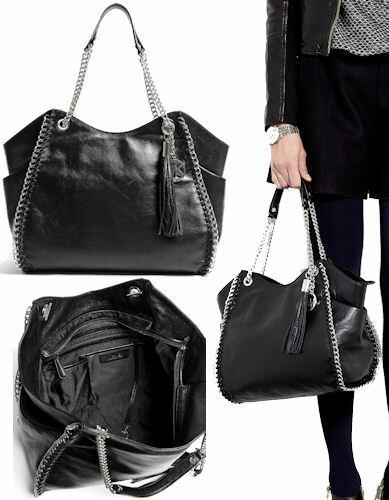 This bag is the newest bag in the Reed Krakoff range having been introduced this year. Michelle Obama is known to be a fan of the brand.